Why is rare Victor Moscoso poster art priceless to me? I’m trying to examine that in this post. Just perfect art in my opinion. What is it? Why does this attract me so much? Could it be he is a Spanish artist? It might be-who knows. Some of my first formal training or awareness of classic art was exposure to early Spanish artists. I could do without Monet or Van Gogh or Renoir – (although greatly admired) did not float my boat. What did …were the men from Spain – Goya, Greco, Picasso, Dali. To me the art was just unfathomable and extraordinary to unbelievable heights. What minds, What imagination. The lineage of great art does not stop in the 19th century; which is apparent in rare Victor Moscoso poster art – painting and other multi-media. Maybe it is the bold strokes and exquisite choice of color inherent to the works of these Spaniards. Ga Ga for Goya! (30 March 1746–16 April 1828) he lived to be 82 years young, way beyond what most men lived in the 19th century. (Which was about 47 years old). Greco died at 73 – he being in the 17th century. Victor Moscosco is 76 years old now. Who is Victor Moscoso? well, you’re on the Famous Rock Posters web site – so you should have a clue. He was best known for psychedelic rock posters/advertisements and underground comix in San Francisco during the 1960s and 1970s. 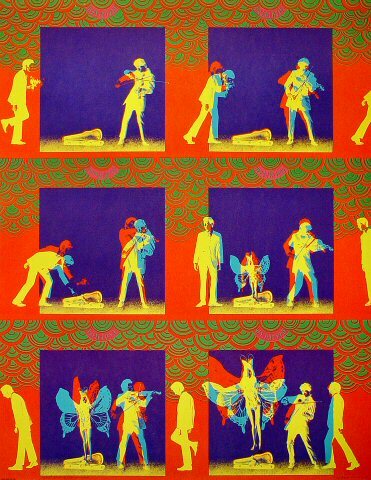 Also, Moscoso was one of the first rock concert poster artists of the 1960s era with formal academic training @ Cooper Union, NY – Yale – SF Art Institute and taught there as well. Sidebar: Josef Albers (March 19, 1888 – March 25, 1976) was Moscoso’s instructor at Yale. He came from (most influential) The Bauhaus school of Germany. To escape the Nazi pressure he emigrated to the USA and landed @ the Black Mountain College, N.C. which is near my hometown. More on that in another post. He is best remembered as abstract painter and “Homage to the Square” series and as theorist. Ok, back to Victor. I would say his first big break was designing posters for the concerts & new music scene in the dance halls and auditorium’s in SF. It culminated to international attention in the late 60’s. Next would be underground comics ,album covers, billboards and multi-media. He went on to win two Clio awards in advertising and design. If anything, view nice – clear- large images of these beautiful works and see for yourself why rare Victor Moscoso poster art is priceless and why I am such a huge fan of this magnificent artist! How Was The Muse Prog Rock Show In Atlanta? Will Society End Up like Aldous Huxley’s Science Fiction Novel? Who Were The Fathers of the Counterculture Movement?